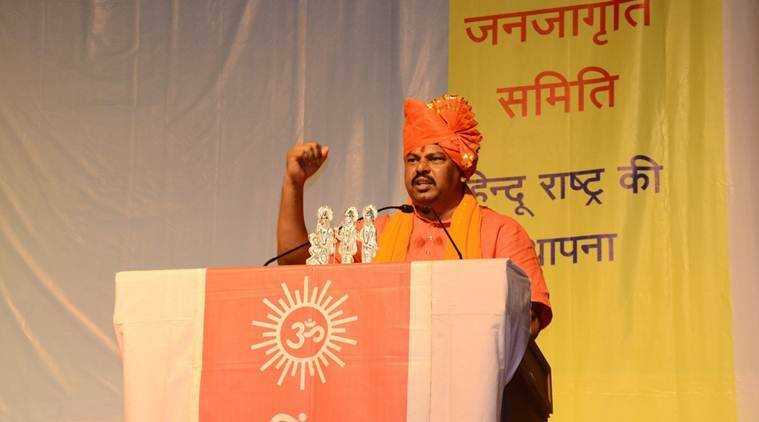 Days after accusing Telangana Chief Minister K Chandrasekhar Rao of indulging in “minority appeasement”, BJP MLA T Raja Singh Lodh on Monday said only those “begging for vote”, host Iftar parties. In a video posted on Facebook, the MLA from Goshamahal constituency in Hyderabad also said that the “green book (Quran) is responsible for spreading terrorism in India” and that he will neither host nor attend any Iftar party with those who “talk of killing Hindus”. “These days, many Telangana legislators are busy hosting Iftar parties, wearing skull caps and taking selfies. They think if they have to do vote bank politics, they will have to think of ‘sabka saath, sabka vikas’ (together with all, development for all). This is their thinking. Those who sit with them (attend Iftar parties) are ‘vote ke bikhari’ (beggars for vote). My thinking is different,” Raja said in the video. This is perhaps not the first time when the MLA has made such statements. He was booked by the police several times in the past over his alleged provocative speeches. Raja had once said that the heads of those opposing the construction of the Ram Temple in Ayodhya must be chopped off.